Utah Lake is one of Utah's 'Urban Fisheries'. Entrance Fees apply year round. Please pay by using the fee envelopes and the iron ranger, or our credit card machine. Both are located in the far right lane as you enter the park. Failure to comply may result in CITATION. Restrooms: Visitor Center restrooms and the CXT on the North Jetty will remain open year round. Reservations can be made up to 4 months prior to your first nights stay. Reservations can be made by visiting ReserveAmerica.com or by calling 1-800-322-3770. Extra Vehicle Fee: $15.00 per vehicle per night. Limit 1 Extra Vehicle per site. Vehicle must be able to fit on pavement inside campsite. The Decontamination station is now open. Please call ahead to schedule a time for someone to assist you. Boating/Sailing: You must self-decontaminate for Aquatic Invasive Species/Mussels if you have visited Lake Powell, or any body of water outside of the state. You must be dry for 30 days during the winter months, 18 days during the spring/fall, and 7 days during summer. If you have a more complex boat with ballast tanks or inboard/outboard motors with unverified water, etc, then you must wait 30 days to dry or get professionally decontaminated. If you cannot meet these minimum dry times, you can contact the park to set up a free Professional Decontamination. Please contact the park at 801-375-0731 to schedule an appointment or contact us on Facebook through instant messaging. For more information on Aquatic Invasive Species, please visit www.stdofthesea.com. Visit Central Utah Water Conservancy to learn more about current water levels. Visit https://www.weather.gov/slc/marine?Utah#tabs-2 for current marine weather conditions. Check out a live view of the harbor, courtesy of the Utah Water Ski Club. Due to the flight path of air traffic from Provo Airport. NO DRONES of any kind may be flown within Utah Lake State Park or surrounding Airport Dike Road. Northern Pike have been illegally introduced to Utah Lake. Any you catch should be killed immediately and reported to the DWR. Utah Lake is the largest (natural) freshwater lake west of the Mississippi. It spans 24 miles in length, 13 miles in width and reaches depths of no more than 12 feet. Despite its enormous size, this immense body of water is often overlooked by anglers as they drive past it on their way to their favorite trout pond. Many trout anglers don't fish Utah Lake because they're unfamiliar with how to fish for warmwater species. Other anglers are concerned about the lake's water quality. The lake is shallow and when the wind kicks up, it stirs up sediment in the water that gives the lake a murky appearance. Anglers have little to be concerned about, however. The Utah Division of Water Quality has found no evidence that fish in Utah Lake have elevated toxic pollutant levels (except for carp which have been found to have an elevated level of PCBs) and the water meets state water-quality standards for recreational use, including swimming and boating. While walleye, channel catfish and white bass are the main draws at Utah Lake, a growing number of largemouth bass anglers are also learning about the healthy numbers of big "bucketmouths" in the lake. Several panfish, including perch and crappie, also are available to anglers. The fish in the lake are not only diverse, many of them are also large. During the summer, it's not uncommon to catch several channel catfish that weigh more than five pounds. One angler recently reported catching two catfish that weighed more than 15 pounds each. Obviously, if you want to catch big fish, you need to use a heavier pound fishing line. One of the most popular techniques for catching catfish or walleye at Utah Lake is to place a large circle-hook through the side of a dead red-sided shiner minnow and fish it along the bottom. Largemouth bass anglers are often secretive about Utah Lake. What many anglers don't know is that the lake provides ideal bass habitat. Many bass over five pounds can be caught by casting a bass lure towards the edge of vegetation and retrieving the lure back to your boat. Although anglers at Utah Lake must release all largemouth and smallmouth bass that are more than 12 inches long, bass anglers love catching these big fish. They're also excited that the water level at the lake is up this year. The higher water has submerged more vegetation, providing the bass with more cover and increasing the chances that bass fishing will be even better throughout the year. "Trout anglers should know that most of the warmwater species in Utah Lake are extremely tasty because of their white, flaky meat and the lack of bones in the filets," says Scott Root, Central Region conservation outreach manager for the Division of Wildlife Resources. "I'm a recent convert to fishing for warmwater species of fish," Root says. "I enjoy fishing at Utah Lake after catching trout at another fishery because my family enjoys having a selection of different fish fillets at dinner. It's great to have a variety of breaded or grilled catfish, walleye and bass fillets to accompany our trout fillets. We've also incorporated more fish into our diet because fish is low in fat and provides many health benefits." In addition to its fishing, Utah Lake has many updated and renovated facilities that are drawing crowds and acclaim. Most of the facilities around the lake have been improved in recent years. Utah Lake State Park, five miles west of I-15's Provo Center Street exit, has been renovated. A new visitor center is the highlight of the new facilities. The visitor center includes informative displays that cover several topics, including the area's history and the endangered June sucker, which is found only in Utah Lake and nowhere else in the world. Improved camping facilities, bathrooms, a newly constructed jetty (to improve the state park harbor and reduce sediment), a fish cleaning station, pavilions, the adjacent Provo River paved running trail and other improvements make the state park a perfect vacation spot. Lincoln Beach, located on the south end of the lake, also has been improved. The Division of Wildlife Resources, in cooperation with Utah County, excavated the marina and access channel and built a new concrete boat ramp, courtesy docks, public restrooms and a fish cleaning station. Two additional boat harbors, the Lindon Boat Harbor on the east side of the lake and the City of Saratoga Spring Marina on the west side, also have been improved with similar facilities. The DWR provided more than $600,000 to the Lincoln Beach, Lindon Harbor and Saratoga Springs improvement efforts. Must immediately kill and not return to the water any Northern Pike caught at Utah Lake. Don't laugh. Carp are actually a very fun species to pursue, and they dominate the ecosystem in Utah Lake. Carp can be caught in just about any month of the year. They are also often snagged by accident when casting jigs for other species such as Walleye or White bass. If you'd like to target carp, you can have a great time catching 2 to 25 pound fish, with most weighing 5 to 10 lbs. The two best baits to use for catching carp are bread dough or wadded up bread, and regular nightcrawlers or worms. Usually it's best to fish them on the bottom with no weight. If a carp feels a sinker on the line, they may drop the bait before you can set the hook. Simply take a fresh slice of bread, wad up a part of it very tightly into a ball over a regular large worm hook. Cast it out and let it set on the bottom in shallow areas near shore. It can be beneficial to use worms, because that way you never know what you're going to have at the other end of the line. You might have a carp one one cast, a white bass on another, and a bluegill on yet another. The next cast you might catch a Walleye or catfish. That's one of the great things about fishing Utah Lake. There is such a diversity of fish species to fish for. 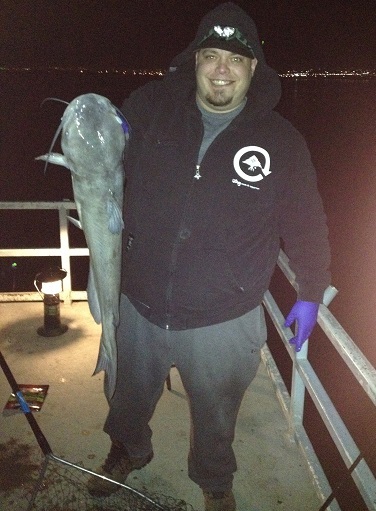 A large channel catfish caught by Steven Miller at the Utah Lake State Park marina in Provo. Channel Catfish are one of Utah Lake's most popular fish. They are relatively easy to catch if you know where to look for them. Some popular baits include fresh carp or white bass meat, shrimp, whole or chunks of minnows such as shiners, anchovies, juvenile carp, chubs or Utah Suckers, nightcrawlers and commercially prepared stinkbaits as well as an array of home concoctions. My experience has been that minnows or carp meat seem to be the best bait to use. Bullhead Catfish are very common in Utah Lake, and can be very fun for kids and pros alike to catch. They are most often caught using nightcrawlers that are fished on the bottom, with or without weight. They are also caught occasionally with the same baits fished for Channel Cats. Sometimes a lucky angler will even catch one using a lure such as a curly tail jig. Largemouth Bass are an overlooked species at Utah Lake. Largemouth can grow quite large here, but most are just a couple of pounds. Since Utah Lake doesn't have very good water clarity due to the silt in the water, site fishing for them can only be done in very shallow. During spawning season, they can be seen nesting in shallow depressions in as little as 1 foot of water. The like structure, so rocky points, submerged logs, and dikes lined with riprap (such as inside the various marinas) are good places to find them. White Bass are one of the most common fish present in Utah Lake. You can find them in the tributaries when the spawn in late May through early June. They are abundant in the Provo River during this time. Sometimes they even hang out in the lower stretches of the river during the hot summer months in deeper holes to escape the heat. The rest of the year, they move around in schools. Target them with small spinners such as Mepps, Blue Fox, or Rooster Tail, or use curly tail jigs, or you can catch them on bait as well. For bait, use nightcrawlers or white bass meat. You can suspend it beneath a bobber or just cast it out and let it sink to the bottom. Although, if you let it sink, you're much more likely to catch catfish instead. Walleye are a very popular Utah Lake fish, sought for the challenge in catching them, as well as for their tasty meat. The most common time to target them is in the early spring during the prespawn and spawning periods (March-April). The 'Bubble-up' near Lindon, and Lincoln Beach are good places to target. Yellow Perch are not very common in Utah Lake, especially in low water years when there is less cover for them to hide from predators. I've caught them along the airport dike in Provo (many years ago). Bluegill are much more common panfish here. They can be caught in the marinas as well as along shorelines where the water is deep enough. Black Crappie are also present in Utah Lake. They can be tough to locate, though. I've caught them in the Springtime in the Provo airport dike area, and I've seen them caught in the Provo Marina at the Utah Lake State Park. Best bet are tiny crappie jigs. Sometimes it helps to tip them with little bits of worm or mealworm, or a tiny chunk of white bass or carp meat. Remember they have very soft mouths, so don't set the hook very hard.